Welcome to a new challenge at Seize The Birthday! The theme is Kraft Card Base, but if that's not your thing, you can still play along with any birthday-themed project. I used my NBUS MFT die, and I was going to back it with white card, but decided to mount it onto another kraft card base instead for a letterpress look. The gift-wrapped present is from Tim Holtz Crazy Things. I couldn't decide whether I wanted the present or the party hat, or whether I wanted this size or the mini size, so I stamped them all onto kraft card and cut them out so that I could try each one on the main card before making my decision. Pop on over to the Seize The Birthday website for some more fabulous inspiration from the design team, and our Surprise Birthday Guest, Becca Cruger. Lucky me! Thanks, Mel - and Tim! Happy Birthday Shirley!! I was bursting to tell you all about it!!! I don't think I'll ever be able to top that present. LOve the letterpress-look! Happiest birthday, Shirley!!! what a fabulous present ... yay for friends like Mel! Love this card,craft is a great base!! Belated birthday wishes, hope you had a good day :) Love the card and faux letterpress and what a treasured gift from Mr Holtz & Co !! Friends are the best gift from the world for us :-) And the gift from Mel is so sweet. Your birthday card is brilliant. I love paper craft, it's a bit raw but it tastes more content than white paper. Great card. Belated Happy Birthday wishes, Shirley! 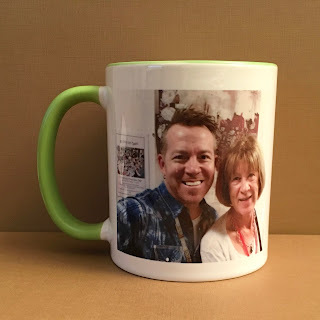 Now that looks like you had quite the time at your Tim Holtz event, and the mug is awesome! 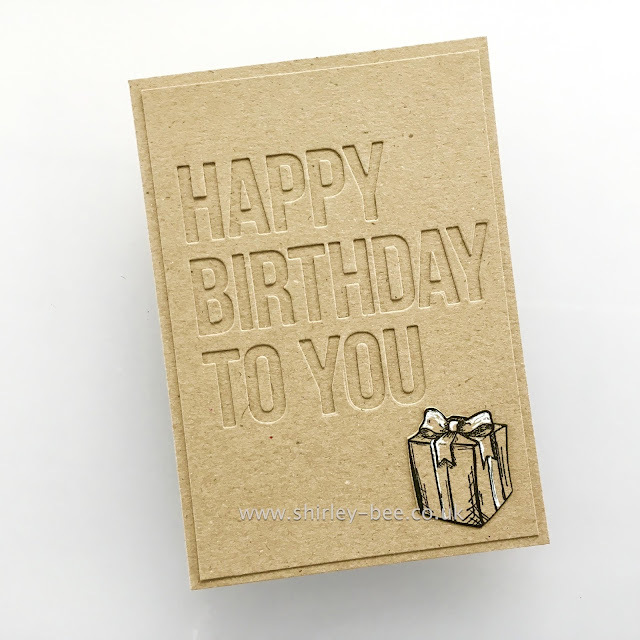 I love your card and the letterpress look, too! WOW! How cool is this! You are a lucky lady! Love your card and this entire post! Sounds like a great time! Belated Happy Birthday, Shirley! Your card has me swooning (borrowing your idea for sure, if that's okay! ); the kraft/black and just a whisper of white is so striking! As for your 'secret' gifts: oh my stars! Treasures! Awesome surprises from awesome people to an awesome person! You are the bees' knees! HOW AWESOME IS THAT! A personalized "your line" signature with Tim's signature! That is so very impressive -- lucky you!! A birthday you won't forget. Also, your kraft on kraft looks terrific! Wonderful presents, Shirley! I hope your birthday was just as splendid!! Your card is just wow!! Perfect combination of CAS+Kraft+Birthday!! Wow!! First I am blown away by your card. I wish that I had done this. But I will pin it for the future. Now, on to your birthday celebration, sure hope that it was great, but the gift must be the icing on the cake for you. Over the top wonderful and so special. Looks like you were well spoiled which I’m sure you deserve and do to others. It always comes around. What thoughtful gifts, your friends knew EXACTLY what to get for you which shows how much they love you! Your card is brilliant, soon as I saw it you inspired me. So simple yet effective. Blessings for this coming next (creative and otherwise) year for you! Well IG isn't always the bees knees... So glad I came to visit. I love this card but OMG, I love the story even more. HOW. COOL. IS. THAT. You're like, cooler than the Queen or something! Happy Birthday wishes, hope it was special!! Happy belated birthday, Shirley! What awesome presents you've gotten! Your card is awesome too! Love that! So cool about the mug and the tag! Lucky you! Fabulous card - love the kraft on kraft.